Strains of Tchaikovsky’s “Dance of the Sugar Plum Fairy” filled the stadium as all eyes turned to the handsome brown Dutch warmblood on the dressage ground below. For the next few minutes, spectators at the London Olympics watched as the horse, Parzival, seemed to float above the dusty ground, legs wrapped in tape like ballet slippers beating perfect time with the music. When the dust had settled, the horse and his 33-year-old rider, Adelinde Cornelissen, had achieved a new Olympic record for the Netherlands, and eventually, the silver medal in individual dressage. It wasn’t surprising that Parzival did so well in the competition—he was the top-rated dressage horse going into the event. What was somewhat surprising was the equine athlete’s age: 15, the equivalent of 53 in human years. More amazing still was the success of even older horses in the equestrian events at the 2012 Summer Olympics. Of the 50 horses that competed in dressage, a quarter of them were age 15 or older. The individual bronze winner, Mistral Hojris, was 17. Parzival’s partner on the bronze-winning Dutch team was 18. It was a similar story in the eventing competition, which combines dressage, cross-country and show jumping: two out of the three horses on Germany’s gold-medal-winning team were over 15, and one on the bronze-winning New Zealand team was 20. When you consider that a human gymnast is generally past her prime at 16 and a basketball player is pushing retirement at 30, these equine athletes are treading on durable superstar territory. It’s all the more remarkable given that just a short time ago, 20 years was considered the limit for a horse’s life span. “We used to say 20 was the end,” says Mary Rose Paradis, an equine veterinarian and associate professor of clinical sciences at the Cummings School of Veterinary Medicine. “A lot of times, owners wouldn’t spend any money on them after that. They’d retire them and let nature run its course.” Within the last two decades, however, there has been a sea change in thinking about geriatric horses. Much like human medicine, equine medicine, including nutrition, dentistry and the treatment of diseases and conditions common in older horses, has vastly improved, to the point where horses are living well—and remaining healthy, active and even athletic—into their 20s, 30s and beyond. 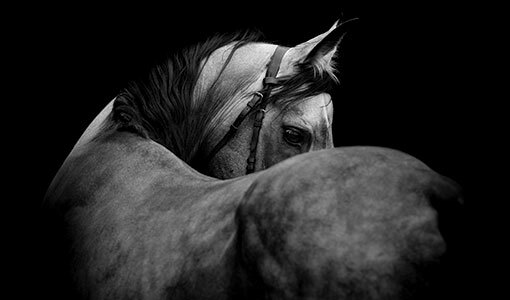 In the last few decades that enduring bond between older horses and their owners has translated into a renewed commitment to their care. Paradis and her student at the time, Margaret Brosnahan, V02, conducted a study of geriatric horses between 1989 and 1999 and found nearly a sixfold increase in the number of horses over age 20 that were coming to Tufts’ Hospital for Large Animals for care—a jump from 2.2 percent to 12.5 percent of the hospital’s total equine caseload. Anecdotally, Paradis believes that number has continued to increase in the decade or so since that study. In a second study, Brosnahan and Paradis found that 10 percent of horses over the age of 20 were still used in competitions. Probably the top reasons for the increase in the geriatric equine population are advances in nutrition and dentistry, which have helped combat such gastrointestinal disorders as colic, which Paradis and Brosnahan found was the primary cause of illness in elderly horses. Another cause was musculoskeletal issues, most of which were degenerative and resulted in arthritis. The most specific condition affecting the older horse is a hormonal disease called PPID (pituitary pars intermedia dysfunction), better known as equine Cushing’s disease. Again, there have been significant improvements in detecting and treating PPID over the last decade. While better nutrition might not seem like a medical breakthrough, it has turned out to be important in increasing horses’ life spans—mostly because of dental problems. “The hypsodont teeth continue to grow out through a horse’s life, so by age 20, the roots are very shallow,” Paradis says. “By 30, horses are starting to lose teeth” and are unable to sufficiently grind their normal feed of grass and hay. Companies have started to make special food for senior horses in which the nutritional components are extruded into a softer feed, promoting better digestion. 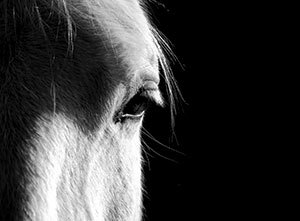 Aiding that perception have been cutting-edge techniques that have helped horses in the healing process, using elements from their own bodies to speed recovery. In the last decade or so, veterinarians at Tufts and elsewhere have achieved success by extracting equine stem cells from bone marrow or fat, culturing them outside of the animal and then reinjecting them in places where the horse has suffered an injury. The regenerative properties in the stem cells help form new cells to bind the joint together. More recently, vets have seen similar success using platelet-rich plasma (PRP), a substance derived from a horse’s own blood that is high in growth factors, which can interact with injured cells and spur tendons and ligaments to more quickly regenerate. “We’ve been using [PRP] in older guys with encouraging results,” says Garcia-Lopez. If horses are exercised routinely, there is no reason that they cannot stay fit into old age. Sobel and her horse O.P. have gone trail-riding for years and still ride regularly three days a week, though they’ve cut back on their trail time. Now, instead of riding for several hours, they’re out 45 minutes to an hour, and Sobel has learned to listen to her horse about when he is ready to head back to the barn. With small changes in food and blanketing at night, O.P. had been remarkably healthy until this past year, when he came down with several illnesses, including the hormonal disease PPID, which affects roughly one in seven horses over age 15. With PPID, small tumors form on the pituitary gland, causing large amounts of hormones to be released into the bloodstream. PPID creates “many different changes throughout the horse’s body,” says Frank, a specialist in the disease. Chief among the symptoms is accelerated hair growth, which can give horses an unnaturally thick, shaggy coat that refuses to shed out. Other symptoms can include excessive urination, fatigue, abscesses, infections and laminitis. “The question is why does it happen in some horses, while others can go to 30 years of age with no problem?” he says. Recent evidence has shown that obesity and insulin resistance predispose horses to Cushing’s disease by inducing oxidative stress that can accelerate tumor growth. One of the difficulties in treating the disease has been detecting it soon enough. “The real challenge has been developing a test to diagnose it in the early stages,” says Frank, a pioneer in using a new thyrotropin-releasing hormone test to detect early stage PPID. The test stimulates hormone production by the pituitary gland so that veterinarians can determine whether the gland is overly active or if there is a tumor. Frank notes that recent research, some of which was conducted at Tufts, now allows veterinarians to screen horses for PPID by measuring the hormone ACTH in a single blood sample and comparing it to seasonal reference ranges. Michael Blanding is a freelance writer in Brookline, Mass. Older horses are great animals for many reasons—they’re smart, generally even-tempered and often trained in special skills such as jumping, polo or dressage. But as they age, the special care they require can get expensive. For her master’s degree in animals and public policy at Tufts, Koncel conducted a study on the adoption of wild horses in New England, collecting demographic information and assessing other factors that might contribute to successful adoption. In addition to continuing that research, she’s also trying to raise awareness about the plight of older horses that may be in great health but in need of a home. One option, leasing, can be win-win for an owner, who receives extra income to care for the animal, while the lessee can enjoy the animal for a period of time without the responsibility of taking care of it for life. “It can be a good thing sometimes to say, look, instead of buying a horse for your kid that he or she is only going to ride three or four years, think about leasing one,” says Koncel. Oftentimes, the gentler temperament of older horses makes them perfect first horses for younger riders. They can be good therapy horses as well, working with the disabled, at-risk youth or returning military veterans. Horses with special skills can also be ideal for intermediate riders. “You can have a high-level dressage horse that can no longer do the more difficult movements,” Koncel says, “but could be leased out to a rider looking to move up in his or her skills and needing a horse with a little more talent.